Samsung may push the Android Ice Cream Sandwich update out to its range of tablets in July and August. According to SamMobile's insider, Samsung will begin the rollout in July, but most tablets will receive the Android 4.0 boost during August. 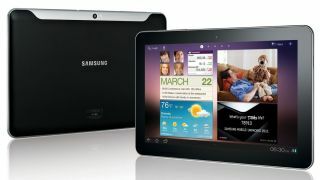 Tablets in line for the upgrade include the Galaxy Tab 10.1, Galaxy Tab 8.9, Galaxy Tab 7 and Galaxy Tab 7.7. Along with the new Ice Cream Sandwich features, the source also claims the update will bring improved battery life and speed to Samsung's tablet range. This is good news for Galaxy Tab owners, although Samsung hasn't confirmed any of these details yet – so they could still be subject to change. Samsung needs to up its tablet game with the new iPad now in stores, a Google Nexus tablet heavily rumoured and Microsoft's new Surface tablet all providing stiff competition. We've asked Samsung if they can provide us with any more official information and we'll update this article once we hear back. Update: A Samsung spokeperson has told TechRadar: "Samsung UK will confirm details regarding the Android 4.0 Ice Cream Sandwich update for all Galaxy Tab devices in due course."